Norwich Cemetery is situated off Earlham Road in Norwich and was used for burials of soldiers from across the Empire, many of whom had been brought to Norwich War Hospital at Thorpe St Andrew. An undated list names all soldiers interred. In 1914 eleven were interred, in 1915 forty-two, in 1916 fifty-two, in 1917 6 sixty-seven and in 1918 one hundred and ten. There were also a further forty-two interments between 1919 and 1921. The first burial, on 25 August 1914, was that of Joseph Reford a Private in the Royal Irish Fusiliers. The last burial during the war took place on Armistice Day itself and was that of Cecil George Marshall a Captain in the Army Service Corps. The Imperial War Graves Commission (IWGC), now known as the Commonwealth War Graves Commission (CWGC), had defined the period qualifying for a war grave as being between 4 August 1914 and 31 August 1921. In 1921 an agreement between the IWGC and Norwich Corporation set out to keep in good order and condition the soldiers’ graves at the Norwich Cemetery. The IWGC would pay 2s 6d per annum for the upkeep of the graves and 3s 6d for the turfing of each new grave. Everitt, cemetery superintendent, calculated that this would give a total payment for upkeep of £32 7s 6d. The agreement named all 259 graves. There are actually 265 on the list but six were excluded as these were already being maintained by relatives. Eighty-two of the graves were those of Canadian soldiers (a mis-match with CWGC records today). In November 1916 the Canadian Administrative Headquarters asked if temporary oak memorial crosses could be erected on the graves pending a permanent headstone. A sketch plan was attached. Permission was given. In September 1918 a plan was submitted for a designated Australian burial ground. This necessitated the exhumations of 11 Australian Imperial Force (AIF) soldiers who had previously been buried together due to lack of space. A designated burial ground meant they could now be interred individually. The work was carried out with great sensitivity and it was planned for before Anzac Day on 25 April 1919 when relatives and friends might visit. 24 hours’ notice was requested so that an AIF representative could be present. A special licence ensured that the exhumation be affected with due care and attention to decency, early in the morning. . . .The proposed removal will not involve the disturbance of any other remains. The eleven men, all Privates, had died at the Norwich War Hospital. Their names were Adams, Donovan, Edwards, Evans, Fitzgerald, Gillespie, Hurley, Missen, Mitchell, Russell and White. It is understood that in many cases in the United Kingdom relatives, friends, comrades, hospital staffs and others have very generously at their own expense erected headstones, marble crosses, and other forms of permanent memorials on the graves of late members of the Australian Imperial Force. For the information of the staff in Australia engaged in the preparation of Australia’s official history of the war, I have been directed to communicate with you and request that you may be good enough to afford me, on the attached form, particulars of any headstones erected on an Australian soldier’s grave. No pains have been spared to preserve undisturbed in perpetuity the graves of the many whom Norwich gave to the war, and for their sake may be glad of the opportunity of paying a similar tribute to the memory of those who, though perhaps not belonging to the City, have been buried there during the war, by granting the Commission the exclusive right of burial in all graves for which those rights have not already been granted. The suggestion of levelling the graves would certainly facilitate work and improve the appearance of ground. . . . The proposed laying out will take about 500 spaces . . . The Australian Government purchased 50 spaces, the Canadian Government 5 and relatives 4. . . . To level the whole of the graves in the Cemetery would be a large undertaking. Each grave would require to be marked. The Public are somewhat against it. Everitt was also concerned about the headstones. While fixing them in concrete would secure the graves’ positions, it could make it difficult if the graves had to be reopened at a later date. The IWGC said that the headstones would be fixed so that it would not prevent reopening in the future should a family member wish to be added at a later date eg. a widow. By 1922 a detailed list had been compiled. Norwich Cemetery also contains the graves of two German prisoners of war. In June 1922 the IWGC informed Everitt that they had taken over the responsibility for enemy graves from the HM Office of Works. The German soldiers were Hans Hessor/Hesser who died 13 April 1914 and Karl Grause who died 11 November 1918, Armistice Day. These records show that work on the war graves continued long after the war. A letter in 1924 confirmed there were 307 war graves and headstones were still being erected in 1928. It is evident that Everitt showed great sensitivity in his work. Despite the scale of the task, sensitivity and care was taken over each individual grave. The IWGC was renamed the CWGC in 1960. Applications for war graves are still accepted today. These NRO records include the CWGC book which lists all the war graves in Norfolk. Today the CWGC lists 349 war graves at Earlham. There is some discrepancy between the CWGC list and Everitt’s records and further research would be needed to find out why. Norwich, St Andrew’s Hall, First World War Exhibition 1919, City Volunteers uniforms on display – the notice behind the display includes an appeal for more men to join the Home Guard. The original glass negative image forms part of the Bridewell Museum’s holdings. 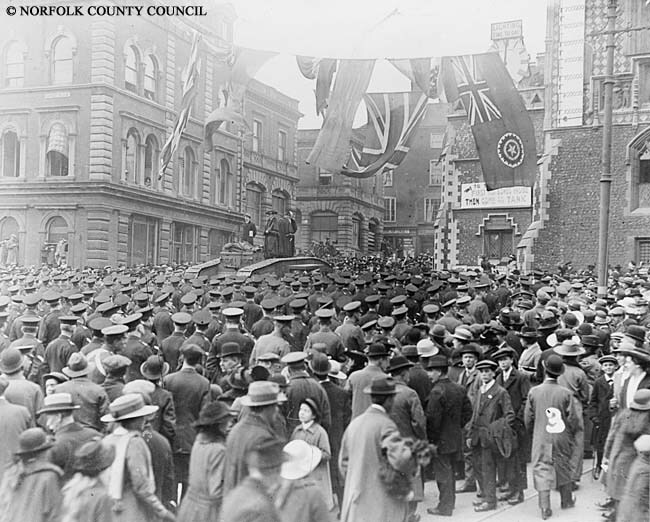 This is just one of several hundred newly published original photographs, posters and notices connected with the First World War in Norfolk, which can be viewed at http://www.picture.norfolk.gov.uk. This is just one of several hundred newly published original photographs, posters and notices connected with the First World War in Norfolk, which can be viewed at http://www.picture.norfolk.gov.uk. In this photo we can see the huge crowds that turned out in 1918 to see a tank and hear the Right Hon. George Roberts M.P. address the crowd. You can read more about Norfolk’s Tank Weeks here. 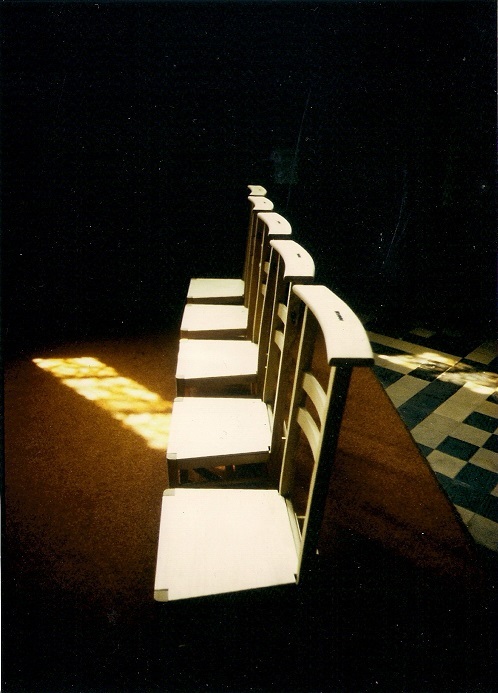 We will be hosting an art installation entitled ‘Assembly – Memorial Chairs’ by Derbyshire artist Val Carman, which will be on display in the church from 10am-3.30pm Monday to Saturday from 25 October – 23 November 2017. This period is particularly poignant given that the centenary of the end of the Battle of Passchendaele is on 10 November 2017. The installation consists of five chairs from Passchendaele’s St Audomarus Church – each representing the casualties of one year of the war 1914-1918 which will be shown by small lead numbers on each chair. Next to the chairs there will be a book with the names of the fallen printed on the left hand side. 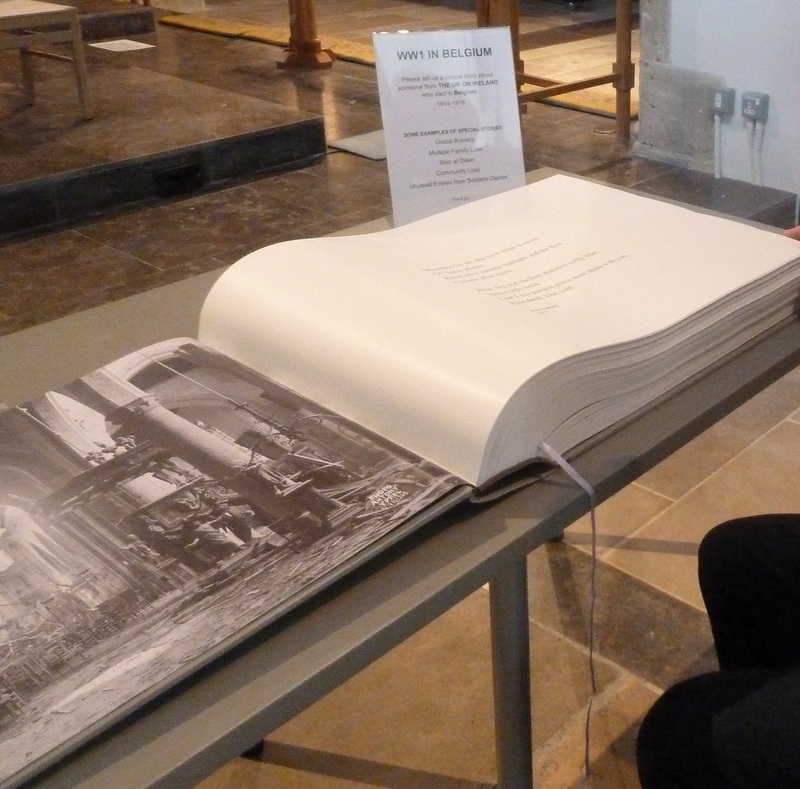 The blank pages left on the right hand side are for visitors to write their own testimony or personal story. 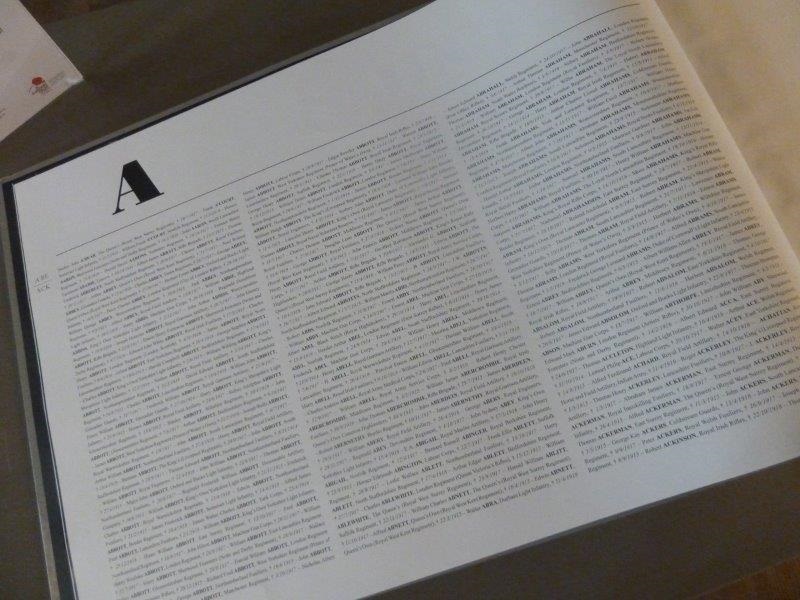 Any story or local references to WW1 can be added to the book – photocopies of images and letters are also welcome. ‘Assembly’ will visit 15 significant sites during its journey and in 2018 the book and the chairs will be returned to Ypres and so we are very proud and excited that St Peter Mancroft forms part of this tour.